Rarest of the elven races, the avariel, the winged elves, live a reclusive existence, seldom seen by outsiders. Such is their scarcity and seclusion, that their status is almost that of legend, and many believe tales of these winged elves to be little more than myth and wild fancy. Avariel are a proud people, aloof to the affairs of the world, save when such concerns impact upon their own lives. Of all the elven races, the avariel are the most serious-minded, and can even be ruthless when necessity dictates, but are just as appreciative of beauty, creativity, and the natural world, but their greatest joy by far, is that of flight. Even when not soaring through the heavens, they can be seen with a far-off look in their eyes. Their love of the unbounded sky is matched only by their discomfort of enclosed spaces, and the avariel suffer from crippling claustrophobia. Physical Description: Avariel are graceful and striking, standing as tall as most humans, though they appear even more fine-boned than their landborn elven kin. Their features are more chiseled, more angular, their eyes larger, and golden, azure, emerald, or rich hazel. The hollow bones that enable them to fly make them frail, though their chests and shoulders are strong, powering their magnificent eagles' wings. Their plumage is usually the purest of whites, though blacks and greys are known, and their hair is white, black, or more rarely, gold or silver. Like other elves, they have no facial or body hair. They prefer simple, loose clothing that does not impede their wings, usually in pale white, grey, or silver. Avariel have shorter lifespans than those of other elves, reaching majority at 50, and seldom living beyond the age of 300. Like other elves, the avariel do not sleep, instead entering meditative trance for 4 hours per day. Despite an aloofness that can astound even other elves, avariel rarely exhibit the haughtiness and arrogance many have come to associate with elvenkind, though they pity all races lacking the ability to fly. They have little to do with other races, only maintaining cordial, but brief, contact with other elven settlements within range of their homes. They reserve their greatest pity for those avariel who are incapable of flight, whether due to accident, injury, illness, or misfortunate birth. Unaccepting of pity themselves, such wingless or flightless avariel seek lives elsewhere, or end their own lives in despair. Avariel Lands: Avariel settlements are rare, located in secluded and inaccessible mountains, their many towers carved into the rock faces and plateaus, resplendent with many windows, perches, and balconies. Their societies are commonly composed entirely of avariel dedicated to one of two paths of life: the path of the warrior, or the path of the aesthete, though a rare few settlements compose members of both paths. The warriors are not all combatants, as might be inferred, though many are, but all follow the philosophy of action, of doing. Aesthetes are the thinkers, those inclined to study, magic, art, music, and philosophy. There is no animosity between followers of the different paths, both of whom have long lineages, and they each support and respect the other to the best of their abilities. Avariel seldom trade with outsiders other than other elves, obtaining from them the rare metal implements that they themselves do not use. Avariel craftsmanship utilizes glass, crystal, obsidian, and stone almost exclusively, even in the construction of weapons, and gems and semiprecious stones are used for currency. Those rare avariel encountered beyond their mountain dwellings are usually those seeking escape from pity due to their inability to fly, or the rare avariel gripped by an overpowering wanderlust. 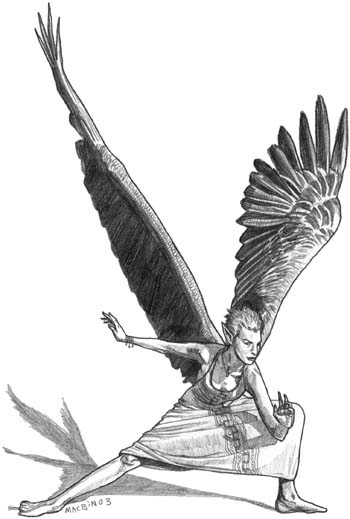 The avariel are a deeply religious people, Aerdrie Faenya, the winged goddess of the air, the weather, and avians. Although their true origins are a mystery, the avariel hold that it is her intervention that enables them to survive, and that they are her favored children. Some avariel even belief that they were the original elven race, though many more of their sages speculate that Aerdrie Faenya's hand melded them with their beloved giant eagles. The avariel speak the same lilting and fluid language as other elves, and some have even devised an intricate sign language based upon this tongue. Some avariel consider it a source of pride to learn and speak Auran, the language of all avian creatures, and a rare few learn a scattering of the languages utilized by those races dwelling in proximity to them. Names: Avariel pick their own names upon reaching the age of majority, though closefriends may continue to use the avariel's "child name". Family names are of vital import to the avariel, whose lineages stretch back untold centuries, devoted to the path which they have chosen. Male Names: Aerontar, Daedamai, Peregrane, Raptiir, Sperenshay, and Talasphir. Female Names: Aerie, Cassae, Esthaenie, Icaria, Lethri, and Nahlrie. Family Names: Adongala ("Peacewhisper"), Driiquar ("Airdance"), Elandinai ("Arrowbreeze"), Kiirquarlani ("Gemsoul"), Silathdiir ("Mountainstone"), and Xilokerym ("Petalsword"). Adventurers: Avariel take up adventuring only if gripped by uncontrollable wanderlust, or seeking a life elsewhere as a result of exile, self-imposed or otherwise. Followers of the warrior path make up by far the majority of those avariel gripped by wanderlust. · +4 Dexterity,+2 Wisdom, -2 Constitution: Avariel are extremely light and graceful but their hollow bones make them painfully frail. · Medium-size: As Medium-size creatures, avariel have no special bonuses or penalties due to their size. · Avariel base speed is 30 feet. They can fly at a speed of 45 feet (average). Avariel cannot fly when wearing Medium or Heavy armor. Custom fitting for armor purchased outside of avariel settlements has a cost equal to half the value of the armor itself. · Low-light Vision: Avariel can see twice as far as a human in starlight, moonlight, torchlight, and similar conditions of poor illumination. They retain the ability to distinguish color and detail under these conditions. · Proficient with either longsword or rapier; proficient with bolas and lasso. Avariel find that the muscles they use to fly, oppose those used to fire ordinary bows. · Avariel may take the Flyby Attack feat as a General feat; this is not a free bonus feat. · Claustrophobia: whenever an avariel finds herself enclosed in a small area for any significant length of time, she must make a Will save (DC 13) or become panicked (-2 morale penalty on all actions; can become aggressive). Saves are made every day. The panic subsides when the character is brought out into the open air. · Avariel find their wings an impediment to motion when on the ground, suffering a -2 attack penalty and -2 AC penalty as a result. These penalties can be negated if the avariel takes the Ground Combat feat (see below). · Automatic Languages: Common and elven. Bonus Languages: Auran, Avariel Sign, Draconic, Dwarven, Giant, Goblin, Orc. Avariel commonly know the languages of their enemies and allies, as well as Draconic, the language commonly found in ancient tomes of secret knowledge. They have developed a form of silent communication somewhat similar to the drow sign language. The avariel trains to fight effectively of the ground. Benefit: Due to specialized training, the avariel is able to compensate for theencumbering effects of her wings when engaging in ground-based combat, negating the usual avariel penalties for doing so. Normal: Avariel suffer a -2 penalty to attacks and AC when fighting on the ground. Avariel are the undisputed masters of glasswork, using glass, crystal and obsidian to produce weapons, utensils, and even the studs on their leather armor. Even the most basic of avariel glass items is stronger than comparable glass items found anywhere else (Hardness 7, 10 HP/inch of thickness), and their masterwork items are every bit as strong as steel. Powerful avariel magicians make extensive use of the glassteel spell in fortifying their communities, and providing exemplary weapons for the defenders of their settlements. The glassteel spell turns normal, nonmagical crystal or glass into a transparent substance that has the tensile strength and unbreakability of actual steel (Hardness 10, 30 HP/inch of thickness). Only a relatively small volume of material can be affected (a maximum weight of 10 pounds per level of experience of the spellcaster ), and it must form one whole object. Arcane Material Component: A small piece of glass and a small piece of steel.